We are going to make plans for the next Academy ID Session to be on October 19th at 6pm on Field 1 again. We would like all U9 Boys and Girls to wear their white SKY jerseys for the next session and the U10 Boys and Girls to wear Black. We highly encourage you to look into attending our Fall Break Camps that are coached by our Academy Coaches. These offer more specialized training and will help the young players develop skill and touch with the ball. 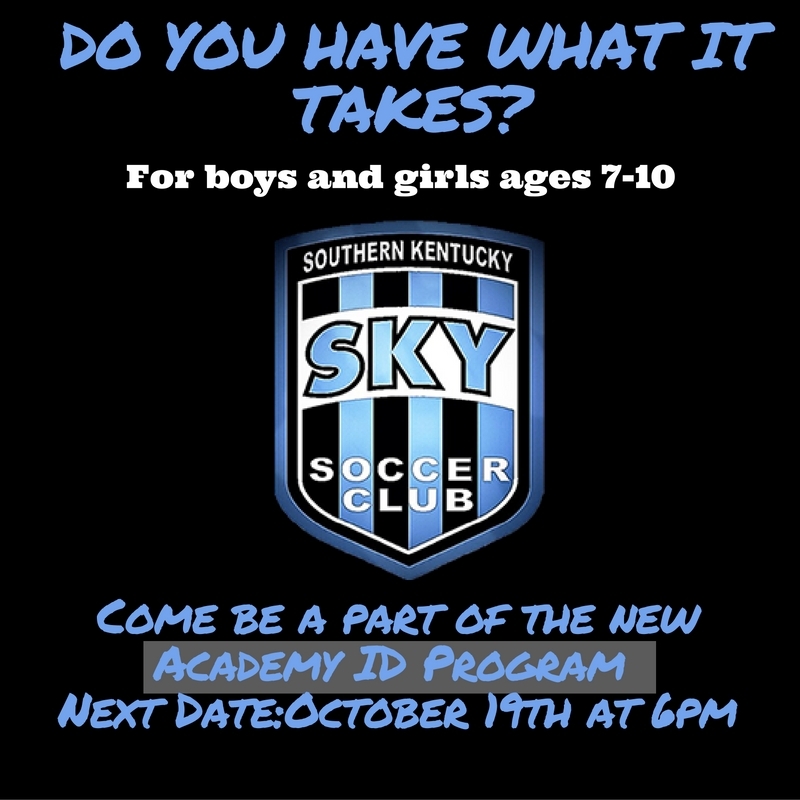 We are excited to launch our new Southern KY Academy ID Program! The Academy ID program is for recreational players ages 7-10. The SKY Director of Coaching, Evan Sutherland, will be running the identification sessions. The SKY Academy U9 and U10 coaches will be on staff to help assist as well as identify players that would benefit from the Academy program at SKY Soccer Club. The Academy Program is geared towards a professional environment with paid licensed coaches. The Academy Program is also focused on developing the skill and technical training of each individual player to help build the foundation for young players to be successful as grow. Technical repetition with the ball will help the players increase their skillset and help each player become more comfortable on the ball. We would like to invite all players, boys and girls, as well as any recreational coach that are interested to this Academy ID session on Wednesday, September 14 at 6pm-7:15pm at Lovers Lane Field 1. There is no cost. Every player should bring a ball, water, and proper training attire (shin guards) There will be a brief post meeting with the Director of Coaching for any parents that have questions about the Academy program.